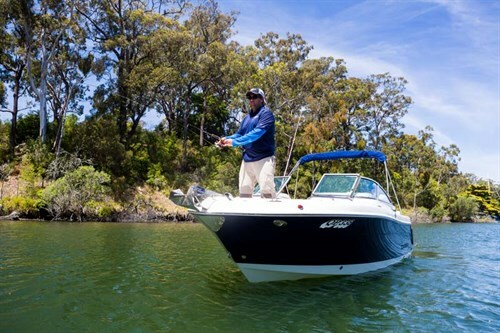 We water test and rate the Robalo R227, a contender in the fibreglass fishing boats category at the 2015 Australia’s Greatest Boats awards. Some might be surprised to see the Robalo R227 at this event. 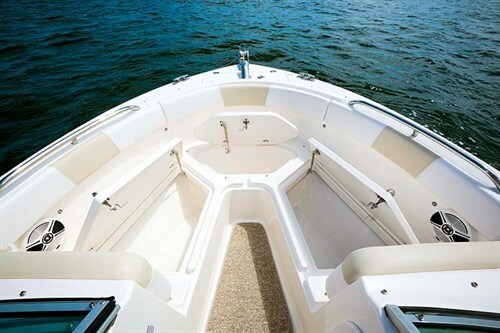 Look under the seats and open the lockers and you will find the backbone of a proper fibreglass fishing boat. A sporty bowrider in a fishing boat competition? You betcha! The Robalo R227 really does have the ability to "go beyond the horizon" as the slogan suggests. The Robalo R227 is about as versatile as it gets. The big, beamy voluptuous hull is a sheer delight, offering an incredibly soft and quiet ride. In his initial test of this model, AGB judge Bear said: "In terms of style, comfort and sportiness, there has always been a sizeable gap between a luxury bowrider and a boots-and-all fishing machine. "And for families looking for the best of both worlds, the boating life has usually been something of a compromise. 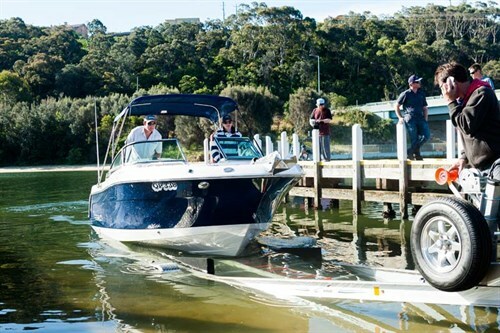 Many manufacturers have attempted the solve the dilemma, and some have come pretty damn close to getting it right, but US boating giant Robalo has taken line honours. "I know many old fishos will scoff at the idea of an open bow on a fishing boat, but I say wake up and smell the roses — boat design has changed just as much as fishing methods." Make no mistake, this is a real headturner, whether on the bait grounds, miles offshore chasing pelagics, trotting around for bread and butter fish in your local inlet or rocking out with a full crew for a party cruise. Combine all of this with the sweet power of the mighty 250hp Honda four-stroke outboard motor with VTEC and she just rocks your socks off with incredible response. All of our judges just loved the Honda outboard, and it had arguably the most appealing note of any of the outboards in the competition. It looked particularly slick with the slimline jet-streamed cowling that Honda has dubbed the "Silver Bullet". The Robalo R227 is a big, beamy dual console with loads of room inside a very efficient 21° deep-vee hull. While the 2.59m beam requires overwidth towing conditions, on the water it equates to a massive feel that gives total confidence. The foam-filled hull’s composite Kevlar construction means ultimate construction strength and inherent safety, while the user-friendly layout combines comfort, practicality and function. Sure it needs some individualised outfitting for sportsfishing, but that’s the stuff fishos like to personalise. The bow has a clever insert that allows you to remove the cushions and create a solid casting platform. I can definitely see offshore anglers throwing stickbaits at tuna schools, bouncing coastal reefs, or even trolling for marlin out of this baby. 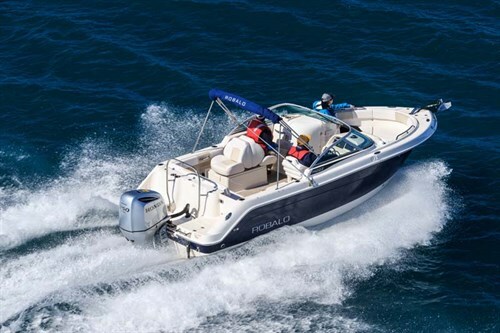 The Robalo 227 has a really pleasing dropped sheerline that works well in conjunction with a fine entry, broadening quickly via the large reverse chines running from bow to stern. It’s soft and quiet in the rough, but incredibly stable at rest. The internal ergonomics are exceptional, scoring a big 10/10 from David Talko-Nicholas. The combination of a full fibreglass liner with plush, yet sensible upholstery makes her eminently comfy and versatile. There’s tons of storage and iceboxes, an easily converted rear lounge with transom access, full width boarding platform with ladder, moulded back-to-back seats with storage/icebox facilities and a stylish dashboard with enough room for large screen electronics. 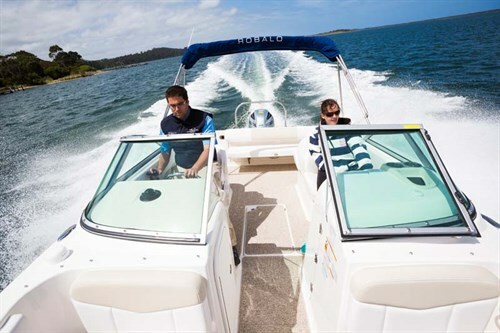 Standard features further include a stainless steel framed bimini, clip-in carpet, freshwater washdown and 75lt livewell. Some fishos might scoff at features like the back-to-back seats, but spend some time chasing snapper and you will appreciate the comfort of a thickly upholstered seat facing your rods. Her ergonomics are quite complex, making the Robalo R227 a breeze to use. But she remains an absolute dream to drive with offshore fishing capability, combined with sportsboat handling. Make no mistake, the Robalo R227 is a big slab of premium, very modern boating at a reasonable price. She’ll be a good friend when the going gets tough and while you could spend a lot more, it’s unlikely you’ll have more fun. The Robalo R227 certainly proved itself a worthy contender, winning both the Innovation and Ergonomics sections outright with 8.9/10 for each. We know at least a few old salts that soon changed their views on fishing boats after riding the Robalo R227.